October 21-27 is Health Care Quality Week and Doulas of Capitol Hill is honored to feature one of Washington, DC’s most loved pediatricians, Dr. Nicole V. Lang, MD, and her practice at Washington Pediatric for this month’s Local Business Spotlight. Dr. Lang is a board certified pediatrician with over 22 years experience in caring for children in the Washington metropolitan area. She is the Founder, President and CEO of both Washington Pediatric Associates and the specialized extension of her practice called, Premier Pediatric Concierge Care. The Concierge Service provides an even more personalized convenient and comprehensive approach to health, education and wellness. 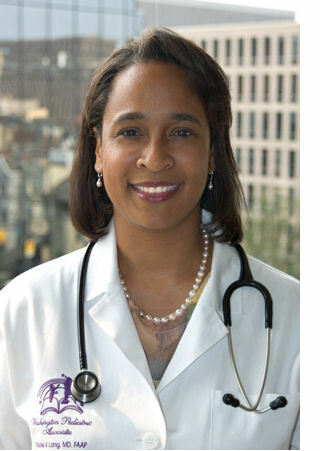 She is recognized locally as one of Washington DC’s Top Pediatric Doctors according to Washingtonian, Washingtonian Mom, Washington Parent and the Washington Post. My life’s calling, since the age of 7, was to be a pediatrician. I am the first doctor in my family and greatly value taking care of “my children.” I am truly living my dream. I absolutely enjoy helping new parents navigate parenthood and watching the evolution of growth and development of my children over 21 years. I also love being able to positively influence children during their formative years. My motto is to help children make “Smart, Healthy, Safe Choices in Life” and encourage them to reach their full potential. I am the proud mother of my daughter, Nia. I had a wonderful natural child birth experience in a hospital setting. I needed a lot of support with breastfeeding during the postpartum period and ultimately did find balance with supplementing with formula. I always say that my baby had the best of both worlds and is thriving today. I want all parents to have the book Touchpoints, written by my mentor and world renowned pediatrician, Dr T Berry Brazelton. This book focuses on a child’s social and emotional health, which is just as important as a child’s physical and cognitive well being. He stresses the importance of having a holistic look at a child and supporting the family in any way possible. New parents need longer maternity and paternity leave to be with their newborns. We need to be a family centered society to help foster the love and support a new family needs in order to thrive. The hardest part of becoming a parent is the amount of pressure parents (especially mothers) put on themselves to be the perfect parent. There is not just one way of parenting. It is a process of trial and error. It is important to trust your gut intuition because it will always lead you in the right direction. Trust the process and remember Self-Care along the way. (Remember the airplane rule: parent put your oxygen mask on first then help your child). I am a wellness advocate for the company, Doterra. I utilize a wide variety of their products personally and in my practice- from essential oils, soaps/lotions to vitamin supplements. There is a new baby/kid product line now available too, that I love. This company also has a wonderful humanitarian mission that helps support poor communities around the world. My mother always taught me to count my blessings. I start each day with a prayer of gratitude for the gift of life, family, friends and nature. I ask God to guide me and give me strength for the day. I also tell my husband and daughter that I love them dearly. My favorite thing to do in DC is to spend time with my family and friends—i.e. hiking in Rock Creek Park, visiting the Smithsonian museums or trying different ethnic restaurants (Cher Cher Ethiopian restaurant is our favorite)—as long as I am with my loved ones, I am filled with JOY!